Charmed by a bird that would make its nest even in the pockets of clothes hanging on a line, Kate Fox-Whyte designed these wren houses. Photo courtesy Toronto Botanical Garden. Shhh—listen, do you hear them? The silences echoing through the air are the songs of the bluebirds, wrens, swallows, and purple martins, migratory birds whose populations are declining at alarming rates. Before stepping into the sunlit gallery at the Toronto Botanical Garden, you might go to the grocery store, the gym, or the pub oblivious to the plight of these birds, blithely accepting the pigeon as our emblematic avian. “For the Birds” is a unique exhibition of twenty-six birdhouses on display at the Toronto Botanical Garden throughout the summer that culminates in a fundraising “Flocktail” party on October 1. Architects, landscape architects, interior designers, cartoonists, tattoo artists, hobbyists, and just plain ordinary folk submitted their flighty ideas to the juried competition last February. Since then, each team and individual has been busy trying to figure out how to build a house for their chosen bird—either chickadee, tree swallow, house wren, purple martin, bluebird, eastern screech owl, or wood duck—that meets the needs of these fussy feathered friends and at the same time has design integrity. The result is a collection of art that works. 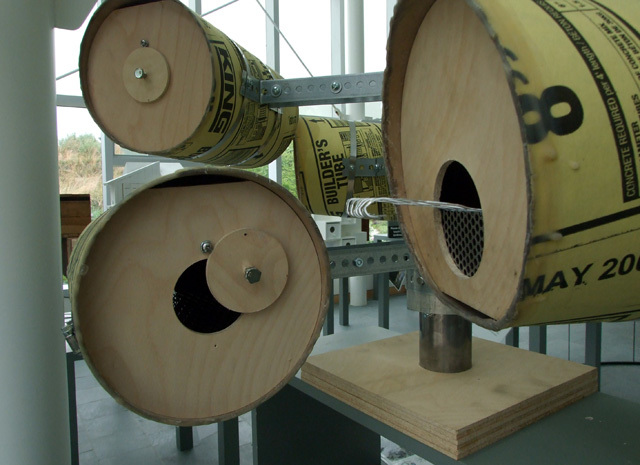 As landscape architect Martin Wade put it when asked what he learned after designing one of the purple martin houses on display, “Don’t let your preconceived notion of design overrule practical criteria.” The birdhouse has to function first. 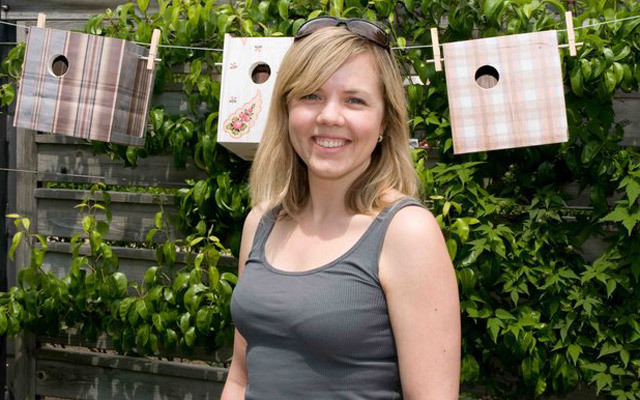 Inspired by the art of origami, this birdhouse is designed so that rain trickles like falling water from top to bottom. Photo by Lorraine Flanigan/Torontoist. Each of the designers at the recent media launch admitted their biggest challenge was to come up with a design that serves the needs of the bird for which it was made. (Birdhouses that aren’t auctioned off at the Flocktail party will be installed in the gardens next season where it’s hoped they’ll attract families of songbirds.) So, whether it takes the form of a condo, Beatles drum, phonograph horn, or rustic barn; and no matter what the material, from walnut, pine, and barn board to wallpaper, fabric, packing crates, and beer bottles, the house has to attract the right birds. And the judges’ comments, which are prominently displayed beside each exhibit, leave no doubt about the (minor) shortcomings of each birdhouse. Top: Neeraj Bhatia, David Delaney, Bas Olsman, Tina Los, Adam Staniland, and Lilia Kiriakou from Diamond + Schmitt. Bottom: Card Bird. Photos by Lorraine Flanigan/Torontoist. 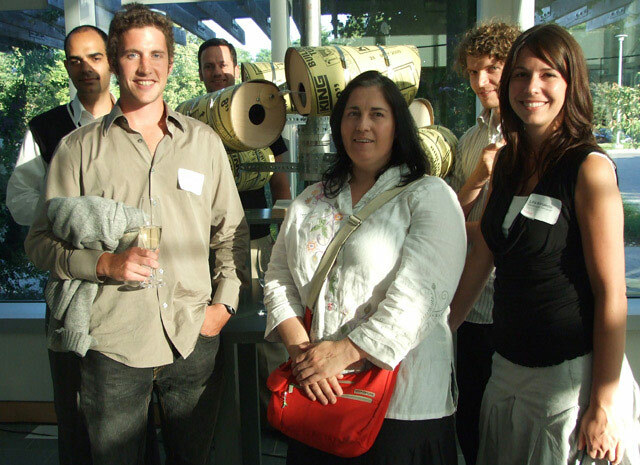 The team from Diamond + Schmitt—yes, the architectural firm that designed the Four Seasons Centre and Museum subway station—spent many of their off hours testing various materials readily available from DIY retailers such as Home Depot before deciding on using sonotubes along with hose clamps, metal mesh, and even beeswax to build their birdhouse, dubbed Card Bird. 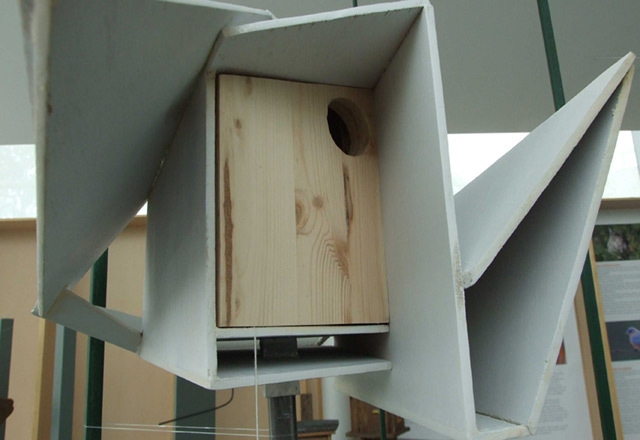 Built to accommodate purple martins, which live in communities of various sizes, the design is based on a modular concept used in many multi-unit residential designs. The bird condo starts with a single unit (like an apartment). More units can be added to the central pole to make a “cluster” (like a low-rise apartment building). And entire clusters can be added to make a “colony” (like a high-rise). At each exhibit, information cards explain the details that tailor each house to its chosen bird. For example, in Barry McCammon’s barn-board-clad screech owl roost, a wooden ladder nailed to the inside of the front wall allows wobbly fledglings to climb up to the entrance opening. James Twines’s sleek owl abode features a solar panel that collects enough energy to power an LED at the end of a metal perch. At night, the light attracts the insects the owl likes to eat. 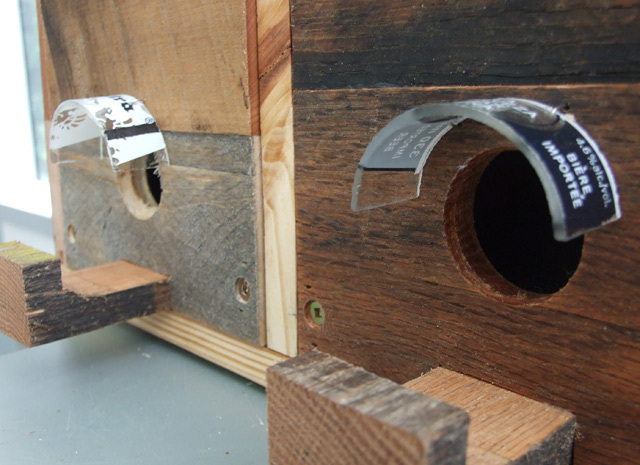 In Kriston Gene’s packing-crate purple martin house, rounded pieces cut from beer bottles are attached over the entrance holes to prevent predators from entering the nesting box. “Awnings” cut from glass beer bottles protect the entrances to this purple martin house. Photo by Lorraine Flanigan/Torontoist. But you won’t believe the imagination and creativity that went into each of these designs until you see them for yourself. “For the Birds” continues until October 1 at the Toronto Botanical Garden. And don’t forget to fill out a ballot to vote for your favourite house in the People’s Choice Award. While you’re there, stroll through the gardens, too, and take a moment to listen to the songs of the birds. “For the Birds” is possible through the efforts of committee co-chairs Colomba Fuller and Tom Sparling and the contributions of dedicated committee volunteers. Lorraine Flanigan is a volunteer at the Toronto Botanical Garden, but was not involved in the “For the Birds” exhibition.